Creature101.com offers a magical world called “Tween,” where the previously healthy creatures have suffered due to the introduction of videogames and junk food to their culture. Each player learns about the benefits of exercise and healthy eating through a set of activities and lessons, which he or she then applies by nurturing an adopted creature back to health. By seeing the creature’s health improve every time the player feeds it an apple rather than a cookie, he or she more fully learns why eating healthy and exercising is important. 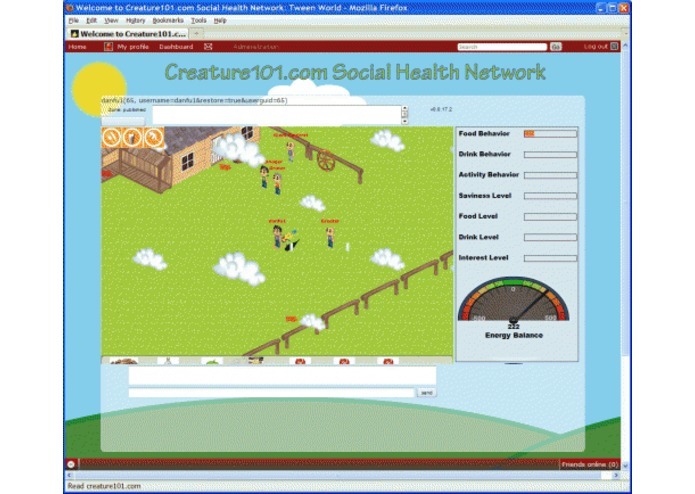 Creature101.com also incorporates many elements of popular social networking websites, allowing players to create profiles, earn badges for the health games they’ve played, and interact with others in Tween. Creature101.com has a unique impact on children ages 9-12 because it presents health information through an interesting and structured narrative that still allows the player the freedom to make important choices about eating and exercise. Through the creature’s health meters, players can see the physical consequences of these choices. Besides applying lessons to the health of the creature, creature101.com encourages players to improve their own health habits. As the story advances, the site asks the player to set goals for his or her own health; in this part the social networking aspect of the site is very important, as it offers a support group as the player modifies his or her own lifestyle. By using the medium of a website, creature101.com allows greater accessibility, as computers with an internet connection are widely available, including at schools and public libraries. The lessons themselves are not presented in a traditional or monotonous manner; players find out about fat in foods from visiting a doctor in Tween, learn why they like the taste of sugar through a comic strip, discover how much fat is in common snack foods through a timed sorting game, and evaluate their own habits through surveys. Through using unique and varying ways to convey knowledge and allowing players to apply that knowledge, first to their creatures and then to themselves, while maintaining the feel of an interactive game, creature101.com promises not only to teach, but also to change children’s health habits for the better.